About Us | Dimond Business & Professional Association, Inc.
Nestled between Oakmore, Glenview, and Lincoln Heights neighborhoods, this district is a hidden gem. 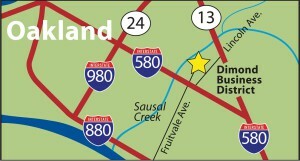 The Dimond District is conveniently located between the 580 Fwy. & the 13 Fwy., and accessible by multiple bus lines. The business district offers a variety of retail stores, restaurants and services with free public parking off Fruitvale Ave on Bienati Way, left at the Shell Station. The Dimond Branch Library is located on Fruitvale Ave. and is adjacent to Dimond Park. On leash dog walking is permitted along El Centro Trailhead, with access from Fruitvale Ave. left on Waterhouse Ave. left on El Centro Ave. Enjoy the beauty of Sausal Creek along with the recent restoration of native plants. Dimond Park provides the community with a recreational pool, picnic tables, Bar-B-Que Grills, and tennis courts. Explore all the Dimond has to offer.